Privacy International has commissioned a YouGov poll about intelligence sharing arrangements between the UK and US. Four-fifths (78%) of Britons think Trump will use his surveillance powers for personal gain, with over half having no trust (54%) that Trump will only use surveillance for legitimate purposes. Three-quarters of people (73%) want the UK Government to explain what safeguards exist against Donald Trump misusing their personal data. In a YouGov poll carried out by Privacy International, 78% of British people say they do not trust Donald Trump to only use surveillance powers for legitimate reasons. There is widespread concern that he will also use his powers for personal gain. Three quarters of Britons want the UK Government to tell the public what safeguards exist to stop Donald Trump misusing their data. As a result, Privacy International has today placed a full page advert in the Gloucestershire Echo [copy attached], a newspaper based in Cheltenham, home to Britain’s lead electronic surveillance agency, the Government Communications Headquarters (GCHQ). The advert calls for more transparency regarding the UK’s intelligence sharing arrangements with the US, highlighting public support for that oversight of these secret powers. 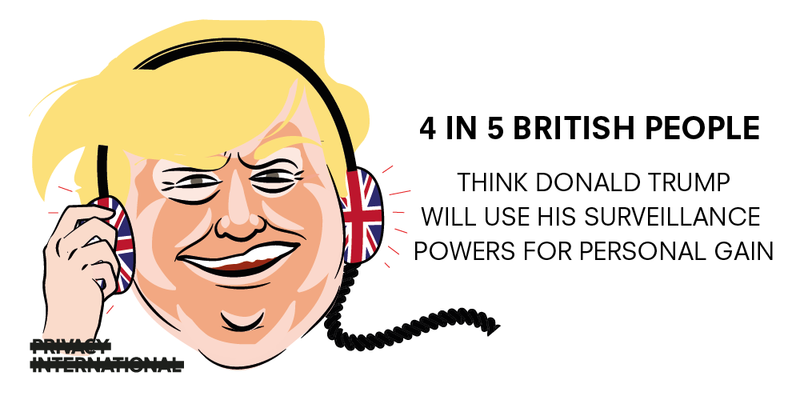 Startlingly, four in five British people (78%) believe that Donald Trump will use surveillance powers for personal gain*. Over half of people asked have no trust that he will only use surveillance powers for legitimate reasons. Given that the Investigatory Powers Act (more commonly known as the Snoopers Charter), has become UK law in recent weeks and considerably ramps up the UK Government’s powers to collect and share our personal data, Donald Trump’s inauguration is a bad day for British people’s privacy. Three quarters of Britons (73%) think the UK government should explain what safeguards exist against Donald Trump misusing data about British people*. The UK’s intelligence sharing with the US is based upon the UKUSA agreement — drafted shortly after World War II — which allows UK and US agencies to share, by default, any raw intelligence, collection equipment, decryption techniques, and translated documents. Current arrangements also allow US intelligence agencies to collect intelligence and operate from within the UK, reportedly including in support of special operations involving lethal force. “UK and the US spies have enjoyed a cosy secret relationship for a long time, sharing sensitive intelligence data with each other, without Parliament knowing anything about it, and without any public consent. Slowly, we’re learning more about the staggering scale of this cooperation and a dangerous lack of sufficient oversight. *All figures, unless otherwise stated, are from YouGov Plc. Total sample size was 1,645 adults. Fieldwork was undertaken between 15th — 16th January 2017. The survey was carried out online. The figures have been weighted and are representative of all GB adults (aged 18+). Except for the decades old UKUSA agreement, no information about the rules governing the extent of this sharing were publicly available prior to a 2013 challenge brought by Privacy International and nine other human rights organisations at the Investigatory Powers Tribunal (IPT), a government body which hears complaints about surveillance activities in the UK empowered to accept evidence from government in secret. Aside from a few paragraphs summarising its approach to obtaining information from the US released during the lawsuit, the UK government has consistently refused to reveal to the public details about its intelligence sharing practices and policies. It has also argued that such intelligence sharing should not be subject to the same safeguards as its own interception powers. The IPT rejected the majority of Privacy International’s claims in judgments in December 2014 and February 2015, although it found the complete lack of publicly available rules on intelligence sharing prior to the lawsuit to be problematic. Privacy International and the nine other human rights organisations have appealed the IPT’s judgments to the European Court of Human Rights. Privacy International is calling for the UK government to release key documents outlining the UK’s intelligence sharing arrangements. The government has already presented many of those documents to the IPT in a closed hearing, but has so far refused to make them publicly available.